The patented Compact SPARCS (Self-Pressurising-Air Rotor Cooling System) technology is a sealed cooling system that utilizes blow by gases from the combustion process which are continually recirculated through the engine’s rotor and integrated intercooler. This process enables rejection of heat directly from the engine core to the main liquid cooling system. Existing Wankel rotary engines available on the market typically use either closed-loop, oil-cooled or forced-air-cooled systems. AIE’s innovative Compact SPARCS cooling system combines simplicity of design with the inherent high power-to-weight advantage of rotary engines, while practically eliminating the drawbacks these systems had in the past.The concept behind Compact SPARCS is the use of self-pressurising blow-by combustion gases which have escaped into the interior of the rotor working chambers via the rotor’s side seals. The pressurised gas is then re-circulated together with atomised oil in a completely closed circuit by means of a main shaft-driven internal impeller that thermally balances the engine.As it re-circulates, the oil-gas mixture passes through the engine’s rotor, absorbing heat before being ducted through an integrated heat exchanger within the engine’s rotor housing. This integrated intercooler rejects heat into the engine’s rotor housing and ultimately to the engine’s main liquid cooling system. The resulting benefits are reduced wear, no wet oil loss, longer time before overhaul, and increased engine life. Using Compact SPARCS technology, overall oil consumption is lower than in most oil-cooled rotary engines on the market and significantly better than any air-cooled rotary engine currently in production. There is also no requirement for oil filters or an oil sump, further reducing weight and required maintenance. 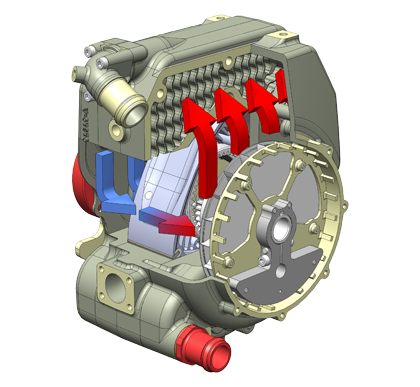 The combination of better thermal control, improved gas sealing, clean operation and reduced oil consumption in a lightweight package means the SPARCS rotary engine has the capacity to deliver unsurpassed performance above other oil and air-cooled rotary engines.